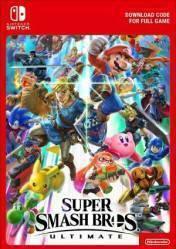 Attention: This version of Super Smash Bros Ultimate is for Nintendo Switch and may be available in several versions. The eShop code version of Super Smash Bros Ultimate can be purchased in stores with the label "eShop Code" and you simply enter the code you will receive in your Nintendo account. Don't forget that many of the digital versions of these games are regionally locked, so pay attention to the activation regions. There is also a version in the account format, which is indicated by the label "Account Format", and we recommend that you read the information about the activation process in stores. Super Smash Bros. Ultimate, the future launch of this Nintendo franchise that pits the most iconic characters against each other, will allow us to fight more players in epic battles and fierce combats with the aim of throwing our enemies off the screen through powerful combinations of blows and combos. We will have a huge cast of characters, as will be present each and every one of the characters that have appeared in each of the deliveries of the series. Thanks to the features of Nintendo Switch, we can fight from wherever and whenever we want. Massive fights between Nintendo characters, unique skills, graphics adapted to modern times, new mechanics and a huge cast of characters,... What more can we, the followers of this series, ask for? There are no comments yet about Super Smash Bros Ultimate. You can be the first one!